Global Business Immigration Handbook, 2015 ed. Global Business Immigration Handbook is an essential resource for businesses impacted by economic globalization and for the legal practitioners representing those businesses. 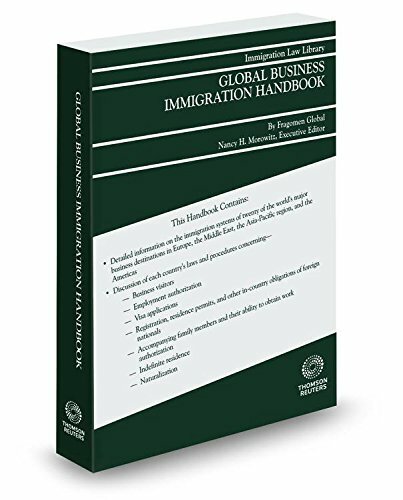 Written by Fragomen Global, the leading provider of immigration services and solutions for the corporate sector, the handbook provides vital information on worldwide immigration laws and procedures. Organized alphabetically by country, chapters begin with an overview of the country s immigration laws, followed by a discussion of: Temporary stays for business, study, investment, and other purposes; Permanent residence; Naturalization; Immigration rights of family members; Employment of noncitizens and their family members; Obligations of noncitizens within each country; Travel restrictions affecting noncitizens. The title also includes numerous representative immigration forms for each country.